I'll be honest, I had never considered attending a river cleanup before my friend brought me along for one a little over two years ago. I'd volunteered in other ways, for other causes, but the idea of doing something for the Potomac hadn't crossed my mind. I am so glad I got myself out of bed for that first early morning cleanup. It wasn't just an enjoyable outdoor experience, it was also a real opportunity to make a difference. I learned that day that the water I drink and the water over 5 million people in our area drink comes from the Potomac. I learned the Potomac is the second largest tributary to the Chesapeake Bay. And I learned that I could do my part to make my local river safe and healthy. Since then, I've been back to volunteer and hang out along the river with Potomac Conservancy many times — for cleanups, paddles, and hikes. I even organized a volunteer cleanup for my office, shoutout IMF! I hope my stories can inspire more local residents to get involved. The Potomac needs as many friends as it can get! My quick take on cleanups: You will have a fun morning outside with friends, and you will contribute to bettering our community in a unique way. Pros: Time in nature; great feeling to volunteer and give back; unique way to spend time with friends. Cons: Waking up early on a Saturday . . . womp, womp. It's a lovely way to spend a Saturday morning with friends rather than eating an expensive and mediocre brunch somewhere. I am always surprised by how beautiful the experience is. Cleanups give me a chance to slow down and get a nice “nature fix.” And the satisfaction that comes from dedicating a few hours to doing something positive for the benefit of something outside of yourself cannot be overstated. 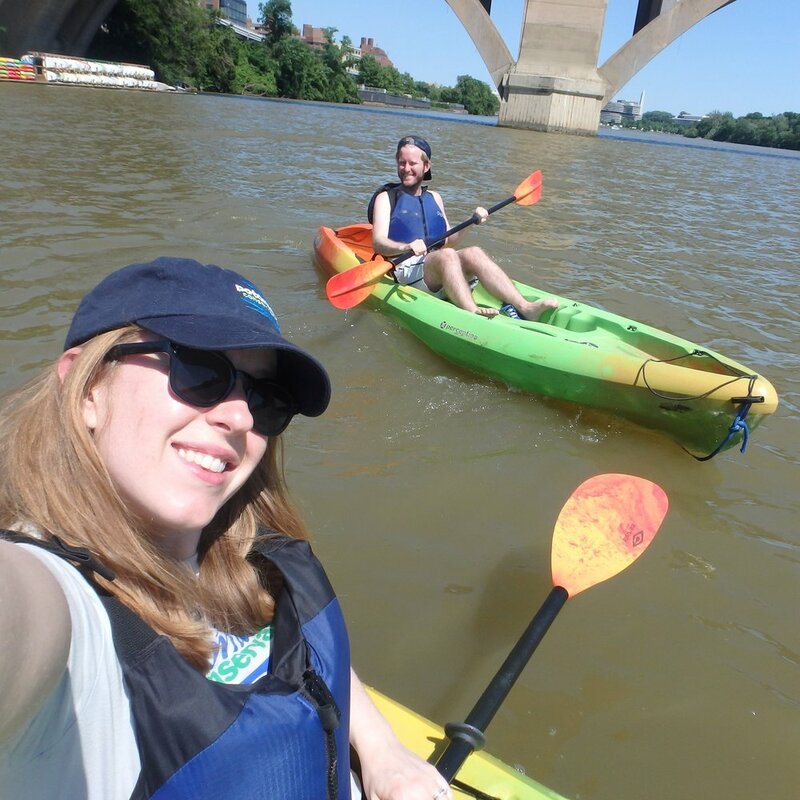 My quick take on paddles: Ordinarily, the Key Bridge Boathouse is busy and expensive, but if you go with Potomac Conservancy you are guaranteed a paddleboard or kayak, there will be a discount, and it’s a ton of fun! Pros: So fun; gain a new perspective on the city from the water; great way to exercise. Cons: Really sore legs . . . Like, I had trouble getting out of bed. Happy hour paddles are a great change of pace and a great way to end any summer day. The first time I ever tried stand up paddleboarding was with Potomac Conservancy at the Key Bridge Boathouse. I was nervous it would be very difficult, but I was able to get the hang of it fairly quickly. I paddled up and down the Potomac for about two hours, not realizing how hard my body was working. The next day, my legs and torso were incredibly sore. It was a great workout! My quick take on planting trees: Your time spend planting a tree is a true investment for the future. Also, if you're like me an live in the city, when else are you going to plant a tree on your own? Pros: I love to dig around in dirt! Also, you feel really good when you see trees later on that you’ve planted. If you're busy and you only have a small chunk of time to dedicate to volunteering, a tree planting might be the place for you. Every tree you plant will help our local environment for decades into the future. The small amount of time you put into it will have a big impact. Tree plantings are also during spring and fall, the most lovely times of year in our area. Like cleanups, it's a refreshing way to spend a Saturday morning. And it doesn't cost a thing! My quick take on spirituality in nature walks: You think you know what it’s like to go for a walk in nature, but going with a professional guide and a group will open your eyes to all sorts of new things! Pros: A guided nature walk helps you to focus on details that you wouldn’t notice on your own; psychologically refreshing. Cons: Literally none. Not a thing. Not surprisingly, the experience was quite spiritual! It left me refreshed. The walk was led by a Methodist pastor, Beth, from the Center for Spirituality and Nature. She was very inclusive of every religious, spiritual, or philosophical tradition. At one point, we were divided into groups on the river bank, and each group was told to use only one sense to engage with the river. My group was given the sense of smell. We closed our eyes, plugged our ears, and stayed silent for five to ten minutes using only our noses. It might look silly, but it was enlightening! Ready to get out on the river?